When we compiled data on average student debt after attending medical school from 1992 to 2017, we found medical student debt increased 123.4%. In 1992, the average medical student debt was $87,297, while it climbed to $195,000 in 2017. There were other economic factors at play during this time as well. The U.S. dollar experienced an average inflation rate of 2.25% per year between 1992 and 2017, and U.S. home prices increased by 158% in that same time period. Examining the data further, we found that from 1992 through 2004, medical student debt steadily increased to $149,126. Debt then sharply increased until 2009 when it reached $182,686. During this time, the Great Recession of 2007 hit and many public and private schools raised their tuition to cover a gap in state and federal tuition subsidies, leaving a greater burden on students. However, in 2010, when the economy began to recover, there was a decrease in overall debt from previous years. In 2010, average medical student debt dropped to $179,737 which was down $2,949 from 2009 and dropped again in 2011 to $176,415. Medical student debt has since increased, hitting $184,013 in 2013 and continuing on an upward trend. To understand the differences in cost between private, in-state public, and out-of-state public medical school tuitions, we compared data from 1996 to 2017. 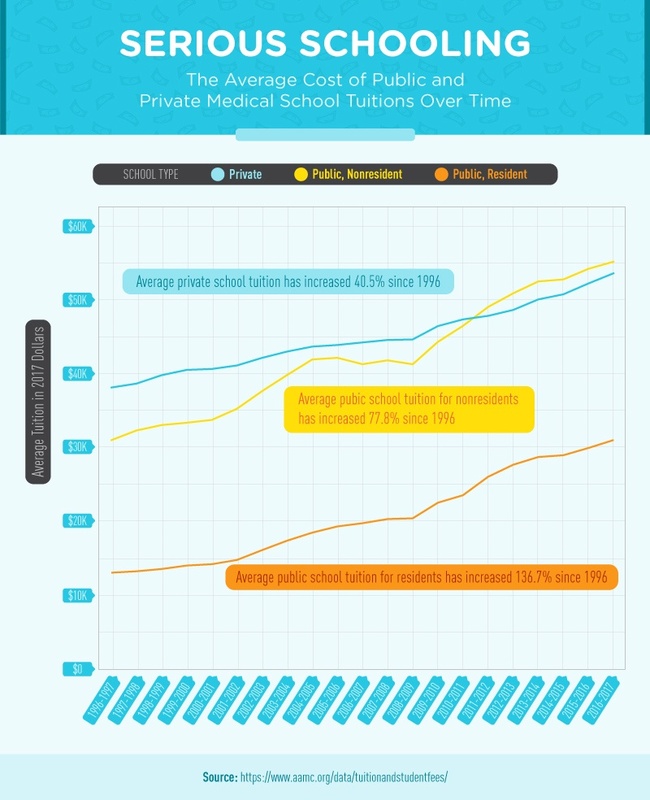 The average cost of tuition for private medical schools increased by 40.5%, while the average cost of in-state public medical school tuition increased by 77.8%, and the average cost of public out-of-state medical tuition increased by 136.7%. In 1996, the average cost of tuition for private medical school was $38,166, which grew to $53,618 in 2017. For public medical schools, the average cost of out-of-state tuition was $31,048 in 1996 and increased to $55,187 in 2017 and in-state tuition was $13,120 in 1996 and jumped to $31,060 in 2017. The costs for nonresidents at public colleges are traditionally higher than for in-state students. This is because public colleges and universities are given state funding to subsidize tuition for residents. If you are not a resident of a particular state, you are not entitled to the same tuition rate. Keep in mind that private school tuition is typically the same rate for both in-state and out of state residents when comparing public vs. private medical school tuition. For example, during the 2011-12 school year, the average cost of public medical school tuition ($49,055) surpassed the cost of private medical school tuition ($47,853). For the 2016-17 year, the average public medical school tuition was $55,187, while private medical school tuition was $53,618. We gathered 2015 graduate debt numbers from the top 50 U.S. medical schools. These figures include graduate and undergraduate debt. Of all schools on our list, Nova Southeastern University in Fort Lauderdale, Florida, averaged the highest student debt total ($259,422). The medical school with the lowest average debt for 2015 graduates was Case Western Reserve University in Cleveland, Ohio, at $165,341. 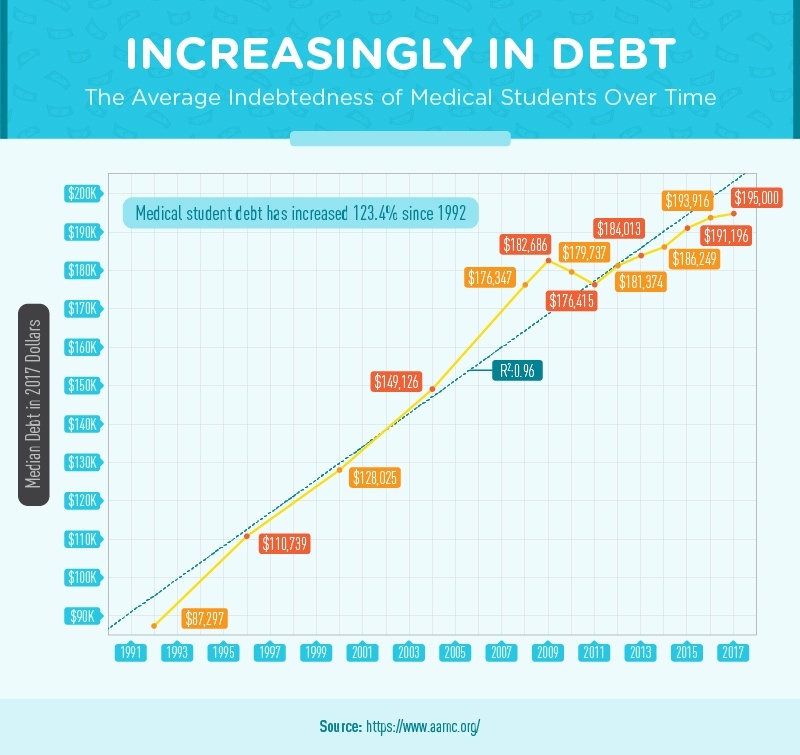 Overall, when comparing these numbers to the overall average indebtedness of medical students, it’s apparent that medical school debt is increasing at a higher rate than average tuition costs. To determine how the value of a medical degree may change over time, we researched medical specialties with the largest and smallest pay growth since 2011. Plastic surgery increased by nearly 63% since 2011, with an average 2016 salary of $440,000. This may relate to the fact that more than $16 billion was spent on cosmetic surgical procedures in 2016 – the highest number in history. Orthopedics saw an over 55% increase and had the highest average overall salary in 2016 at $489,000. Emergency medicine also saw a large increase from 2011 at more than 43% with an average salary of $339,000 in 2016. 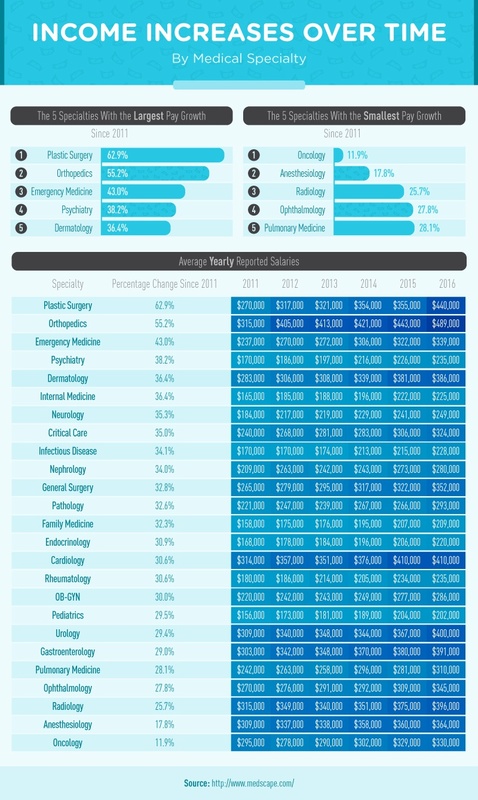 Psychiatry and dermatology rounded out the top five largest pay growths, each coming in at 38.24% and 36.40% and average salaries of $235,000 and $386,000 respectively in 2016. Oncology had the smallest pay growth since 2011 at less than 12% but had an average 2016 salary of $330,000. Another specialty with a small pay increase was anesthesiology at 17.8%, yet it still had an average 2016 salary of $364,000. Radiology saw a 25.7% increase and an average salary of $396,000 in 2017, while ophthalmology had a 27.8% boost and pulmonary medicine jumped 28.1% in pay. While these pay increases are less dramatic, they are still increasing and are high salaries overall when compared to peers in other specialties. For pay satisfaction, we compiled data from Medscape Physician Compensation reports from 2012 to 2017. 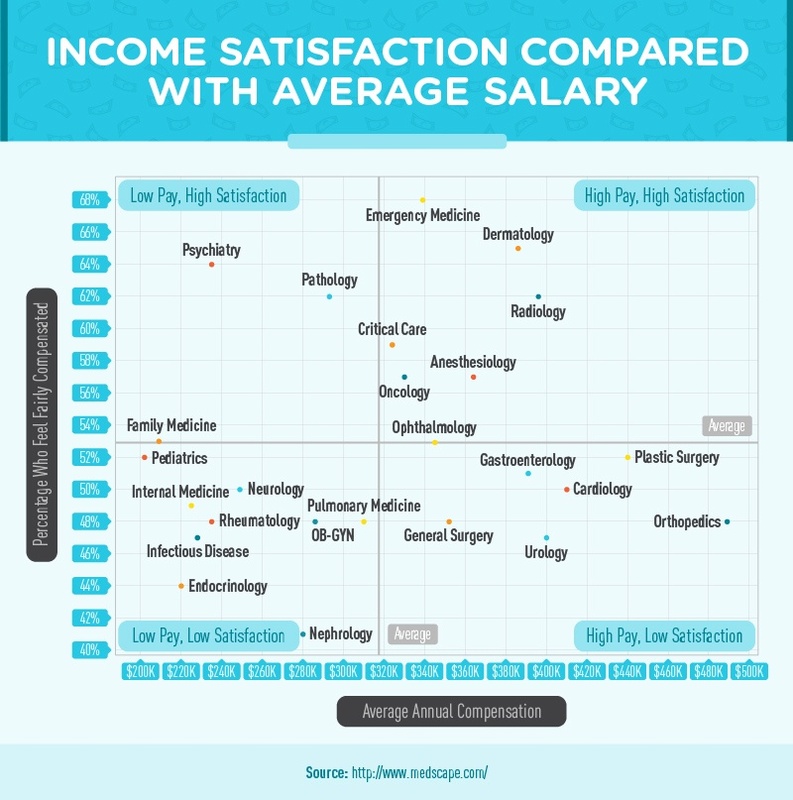 The five specialties with the biggest increase in pay satisfaction were plastic surgery, urology, endocrinology, rheumatology, and neurology. Plastic surgery had the highest increase in pay satisfaction at nearly 37%, followed by urology at 17.5%, endocrinology at 15.8%, rheumatology at 14.3%, and neurology at 13.6%. The five specialties with the biggest decrease in pay satisfaction were anesthesiology, orthopedics, dermatology, infectious disease, and nephrology. Those who specialized in nephrology saw a 10.9% decrease in pay satisfaction, while infectious disease specialists had a 9.6% decrease in pay satisfaction, followed by dermatology at -8.5%, orthopedics at -4.0%, and anesthesiology at -3.4%. We also wanted to compare the percentage of people who were satisfied with their salary compared to the average salary for that specialty. Physician burnout is a problem in the field and may account for some of the satisfaction levels, regardless of salary. For example, while urology is one of the highest paid specialties, it also has a 55% burnout rate. And when it comes to pediatrics, which is one of the lowest paid specialties, the burnout rate is 53%. Choosing to go to medical school is only the first step towards becoming a practicing physician. And choosing the right medical school can be an exciting and nerve-wracking experience as well. From selecting the school itself and deciding how much you’ll need for tuition to settling on a specialty, it can feel overwhelming at the least. Let CometFI help with some of that burden. We may not be doctors, but we can help check up on your finances, so you can get the money you need for medical school and beyond. 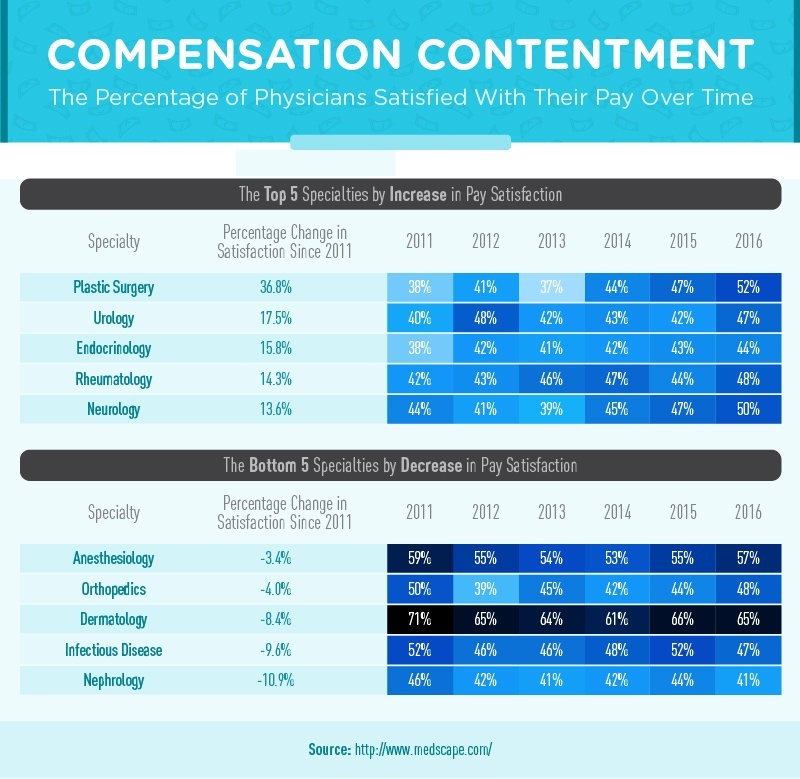 We compiled data from annual Medscape Physician Compensation reports from 2012 to 2017 to look at compensation satisfaction as well as median specialty incomes. Income and satisfaction presented in the 2012 through 2017 reports are based on the previous year’s survey. Therefore the labels in this project surrounding compensation and debt are labeled as the year they reflect, not the year the study was released. Debt and tuition comparisons were adjusted for inflation using the annual averages found here and were based on data provided by the Association of American Medical Colleges Graduation Questionnaire and tuition reports.